Please note: This camporee is not run by Troop 200. This page is only intended as information for Troop 200 families and scouts. Anyone not from Troop 200, please visit the Camporee pages hosted by Troop 360 at http://troop360pc.com/put.htm. Thank You. they may be printed and signed / handed to me at a T200 meeting, or given to Mr. Moffit or Mrs. Vanderbilt at the sign-up table. This year’s camporee will be the 25th annual, and also the 100th year anniversary of the Perry Memorial. 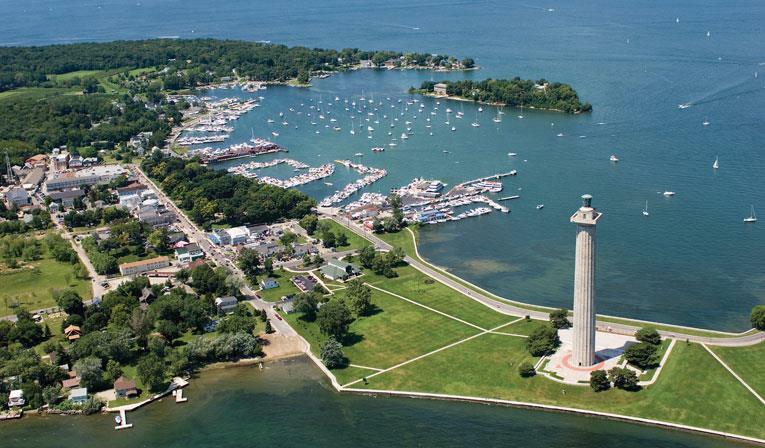 Camping site is outstanding, in the shadow of Perry’s monument and adjacent to the shores of Lake Erie. Don’t miss the South Bass Camporee! You are cordially invited to Troop 360’s 23rd Fall Invitational Camporee on South Bass Island, Ohio. The camporee will be held on September 6, 7 & 8, 2013. Again this year the camporee will include attractions and events for your Troop to enjoy. — Scout/Scouter health & parental release-permission form (you will need to copy for everyone attending). No Scout or Scouter will be admitted if you do have the health information & parental release form or are not listed on your troop roster. — List of items you will need to bring with you. — Ferry boat and shuttle transportation tickets. No personal or troop vehicles will be allowed as we provide transportation to and from the ferry docks. Should a Troop drive an unauthorized vehicle to the Island, you will be asked to remove it to a mainland parking lot at your expense. Adhering to Safe Scouting guidelines and others outlined by the National Park Service at the leader’s meeting Friday night. We will have EMS at the Camporee site. Troops will need to present proof of a local or national tour permit at check-in.